Conflict, action, adventure and one devastating death await listeners as Eragon battles on behalf of the Varden while Galbatorix ruthlessly attempts to crush and twist him to his own purposes. Can he become a leader who can unite the rebel forces and defeat the King? the more i read the inheritance series I hope they re make the first movie, this whole series has the ability to rival that of "Lord of the Rings"
Brilliant author, a great reader and a fanatic narrative. Definitely worth a buy, and purchase. It was brilliant you just want him to continue writing and to think that he wrote the first book when he was 16 it's incredible. If you've read or seen lord of the rings eragon is about the same but with more magic in the story and bit less wars. I am genuinely loving the the series. I love the way that the story is evolving and how the characters are coming to life in their own ways and in their own situations. 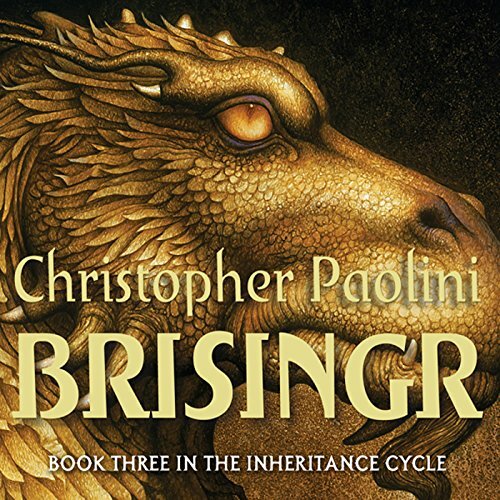 once again another amazing read and absolutely exciting with more of Paolini's world building and Gerrard doyle's narration. Very enjoyable, although some of the book could do with being much less detailed. The dwarf section is immensely tedious. The characters and plot twists are rip offs of other films and books from geekdom, but the overall story arc is well written. Roran's story was very enjoyable, but peaked with a ridiculous scenario that weakened the plausibility of his human, normal limits. The narrator is easy to listen to and the accents of the characters and races much easier on the ear than other books in the series I have listened to. really enjoyed this book along with the preceding 2. looking forward to listening to the final book. This was a good book. There’s nothing more to say. Apart from that now to start the final book. I can’t wait to see what happens next! horrible voice for the dragons tho. it took away from what saphiras character was supposed to be.